He finally decided on a Salted Caramel theme, but he couldn’t decide on whether it’d be plain caramel, peanuts, or ice-cream. Line baking tray (we used Pyrex dishes) with lightly oiled parchment paper (line first, then brush on the oil). Use a clear oil (vegetable oil), as that is tasteless. In a small saucepan, add the cream, butter and salt and bring to a boil. Remove from heat and set aside. In another small saucepan (heavy base), boil the remainder of the ingredients, the glucose syrup, sugar and water until the sugar is dissolved. 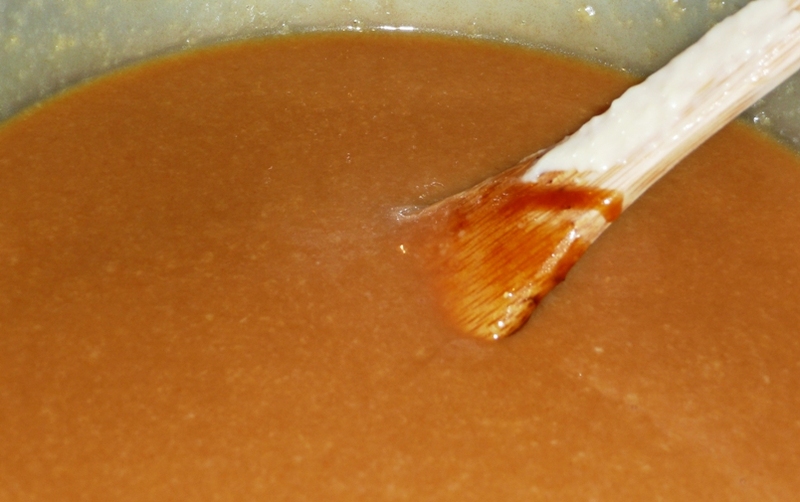 Without using a spatula or a spoon, gently swirl the boiling mixture around until a light golden caramel is formed. Carefully stir in the cream mixture and simmer, stirring frequently until the caramel for about 10-15 minutes (Temperature should be around 120 degrees Celsius). Pour the mixture into the prepared lined tray/dishes and let cool for 2 hours. Very carefully, dry heat a cup of sugar in a medium saucepan (heavy base), spreading it out with a fork. It will heat up pretty quickly and can turn burnt and smoky if you don’t pay attention to it. Once the sugar melts, the colour should change to a dark gold. Once that’s done carefully add 1 1/4 cups of cream into the mixture (be careful as it will splatter!). Stir until all the caramel has dissolved. Transfer to a bowl to cool and add the Fleur De Sel and vanilla extract. In another saucepan, boil milk, the remaining cream and sugar until all sugar is dissolved. Lightly whisk eggs in a bowl and pour half of the hot milk and cream mixture in a steady slow stream (taking care to not cook the eggs). Pour the mixture back into the saucepan with the rest of the milk/cream mixture and cook over medium heat (be careful not to let it boil). Constantly stir with a wooden spoon until the custard coats the back of your wooden spoon. Pour your custard through a fine mesh sieve twice. Stir in the cooled caramel. 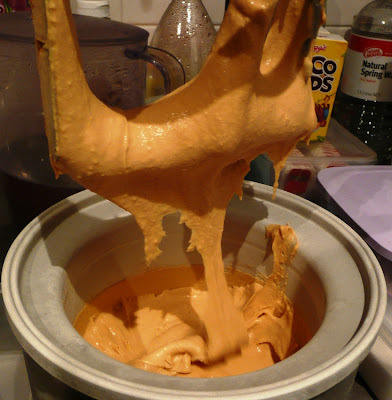 Mix both custard and caramel until well combined. Chill the mixture around 4-6 hours or until completely cold (stir the mixture a few times during the chilling process). Place your mixture into an ice cream maker and follow the manufacturer’s instructions to form your ice cream. Add glucose and thickened cream in a saucepan and bring it to boil (stirring the mixture). Place it aside and keep it warm. In another saucepan (heavy base), heat the sugar over medium heat (constantly stirring) till it dissolves and turns to a light gold colour. 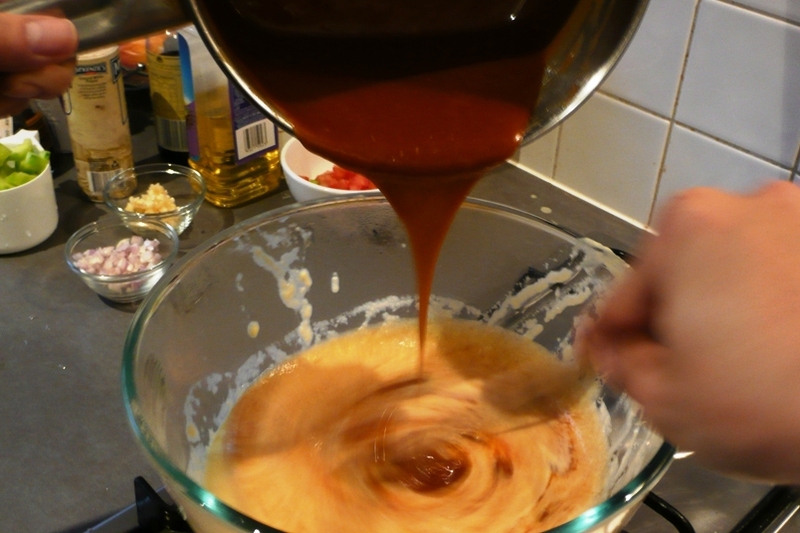 Gradually add your hot cream mixture into the caramel (in a steady slow stream) while constantly whisking it to combine. Add butter and stir well till combined. Turn off the heat and add peanuts and fleur de sel. Mix well to combine. Leave mixture to cool and it should harden up. When mixture has hardened, break into small chunks/clusters. Take about 4-5 small squares from a block of chocolate. Microwave them on high for 30 secs. Take the chocolate out and stir until they completely melt. Spread a thin layer of melted chocolate onto baking paper. Place in the freezer till it turns solid again (you can curl the baking paper so it forms a U-shape or any other shape you prefer). Take the chocolate out and break into any shape that you like. Brush a small amount of chocolate on the plate. 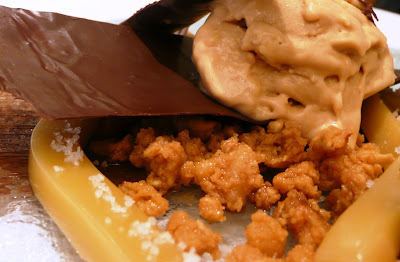 Use the peanut caramel to form the base. You can choose the fleur de sel caramel shoe-string/noodle to form a nest for the ice-cream. 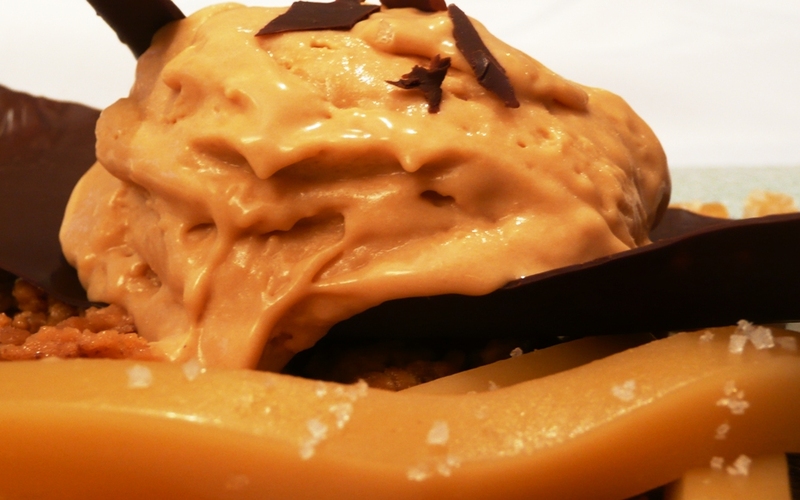 Scoop a generous amount of ice cream and place on the peanut caramel. Using the chocolate pieces, scatter around the plate. For an artistic touch (because this is a Salt theme after all), scatter some Fleur De Sel around the caramel shoe-string/noodle. Voila! There you have it! A beautiful and fun creation to enjoy and feast upon! The creamy texture of the ice-cream goes extremely well with the chewy texture of the caramel shoe-string/noodle and the crunchy texture of the peanuts. Absolutely divine! Be prepared for a super sugar rush! Hope you enjoy this version of our Fleur De Sel Caramel ‘Sneakers’! 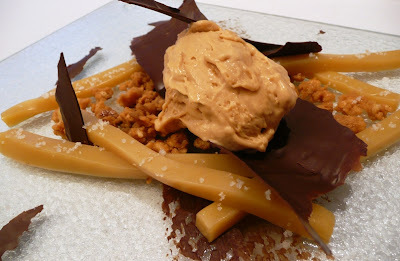 I would like to give special attention to Epicurious.com and David Lebovitz’s Salted Butter Caramel Ice-Cream and Phillipa Sibley’s Snickers Recipe, for recipe inspirations to this dish. Note: I have to apologise, it was a really busy week and I didn’t really manage to take as many photos as I would have liked of each step in the process of making this. Mmm… caramel, peanuts, chocolate and ice cream – all so delicious with a bit of salt! Looks like you had a lot of fun…more fun means less photos sometimes. Conor: It was him! It wasn't me!!! What an impressive dessert dude! I've never actually eaten my sneakers before, but I certainly have no hesitation eating this one! Wonderful plating and flavors, well done! 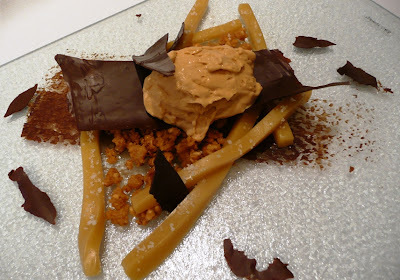 Well, one of my fave chocolate bars in an ice cream dish…me likes! 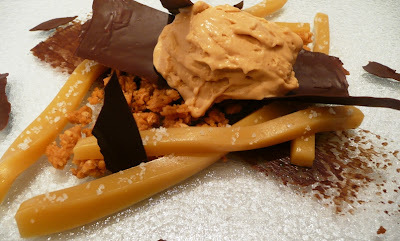 peanut, caramel and chocolate – what can one ask for anymore? Ooooh ahhhh… only one criticism, I think my invite got lost in the mail (or forgotten in the sugar rush) 😉 Looks fantastic! Well done to you and your Boy. I think I'd get a massive sugar rush from this- which is just as well because I love sugar rushes 😀 Gorgeous recipe! Wow, I love the idea of these Fleur De Sel Caramel 'Sneakers'! How creative and delicious! oh yum….yes please I'll have a serve!